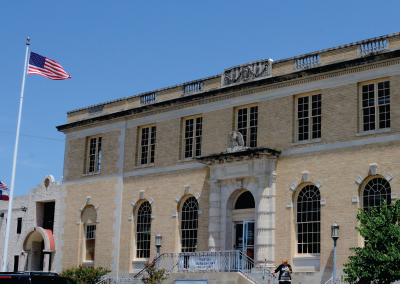 Click through the gallery to tour the city’s architectural history through our self-guided, historic walking tour featuring more than 25 buildings. Or pick up a map from the Chamber of Commerce and see for yourself! The railroad was the centerpiece of early Taylor commerce. In the 1870s, the I&GN depot was also used as the Union Station. The Missouri Pacific Railway came to Taylor in 1882 and located on First Street. 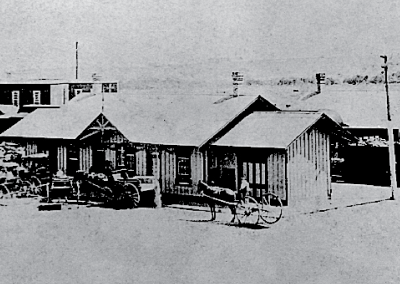 A larger depot was built that has since been demolished and replaced by a smaller depot operated by Union Pacific. 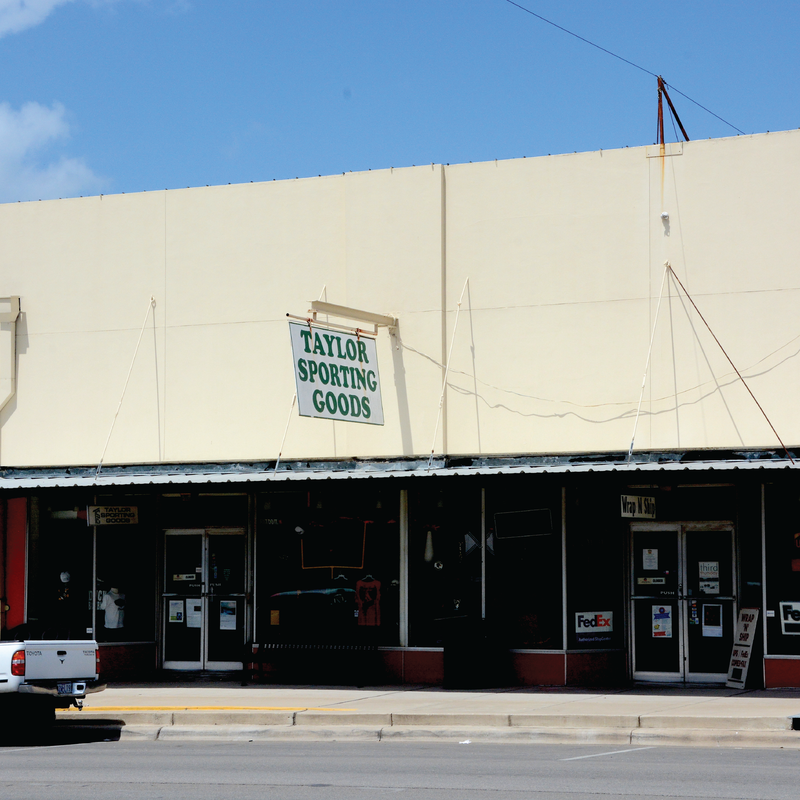 Taylor is an Amtrak stop between Austin and Fort Worth, but does not utilize the building. 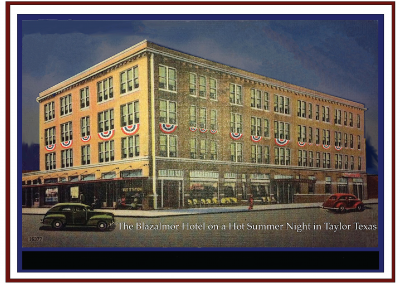 The original 1917 Murphy Hotel changed its name to Hotel Blazilmar for its new owners Howard Bland, A.J. Zilker and T.W. Marse. 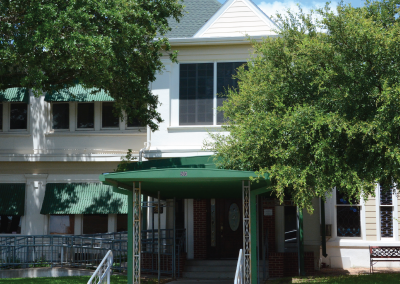 The four-story structure was fireproof and had steam heat and ceiling fans in each of its 90 rooms. A ballroom on the second floor was used for social gatherings. The hotel also served as the Greyhound Bus Station. 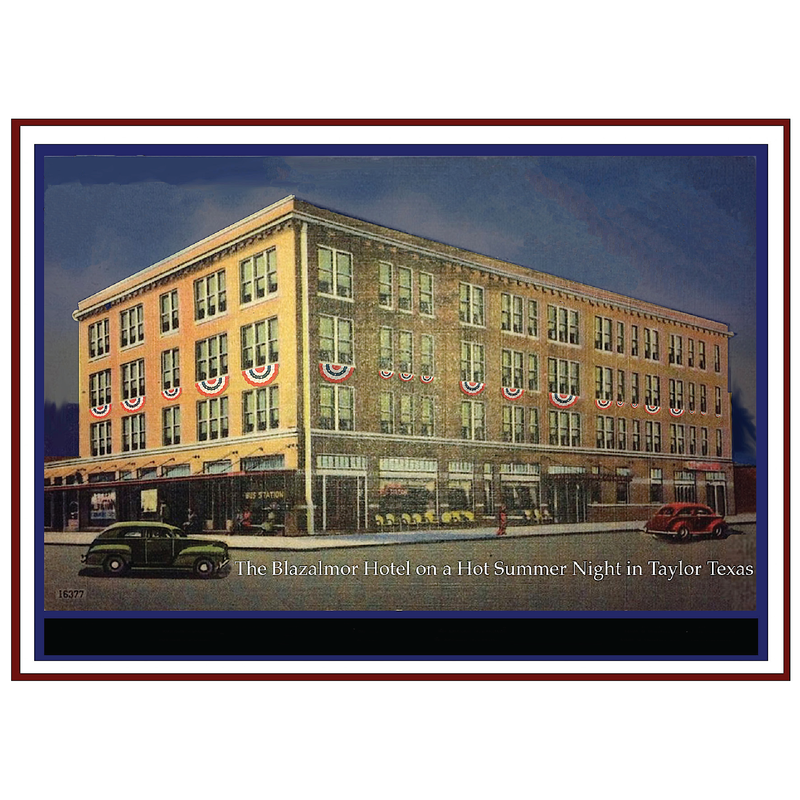 In 1920, the St. Louis Browns wintered in Taylor and roomed at the hotel. The coffee shop was the only place to get a meal after 9:00 pm and was well known for its chili. The Kemp Hotel, now known as Taylor Café, was built in 1877. This building is said to be one of Taylor’s oldest existing buildings, being one of the few structures to survive the fire of 1879. The top story burned and was removed in 1950. 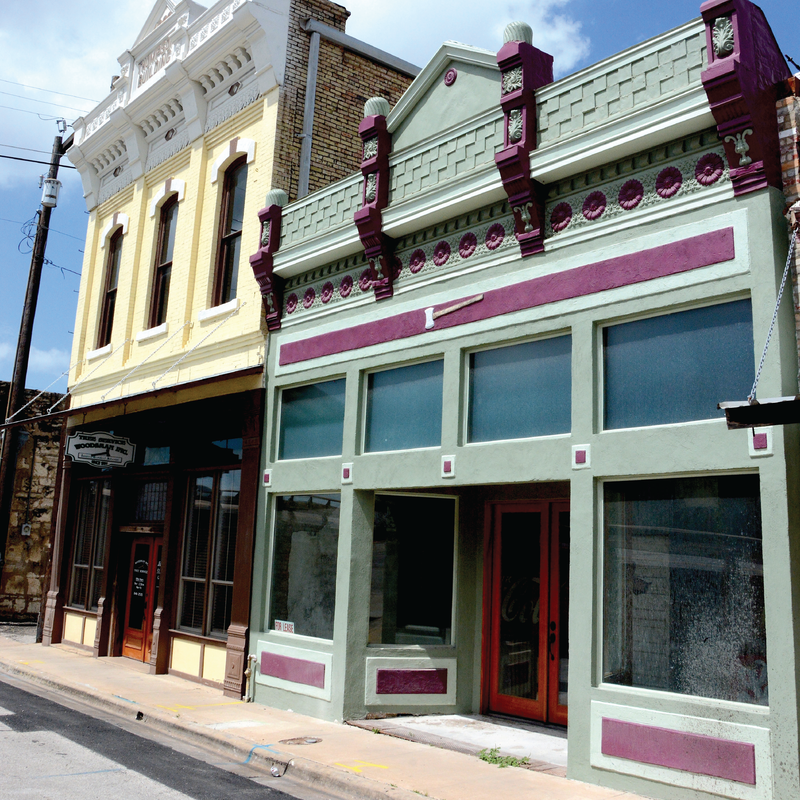 The Thompson buildings were built in 1889 and have been completely restored, housing The Woodsman and other businesses. 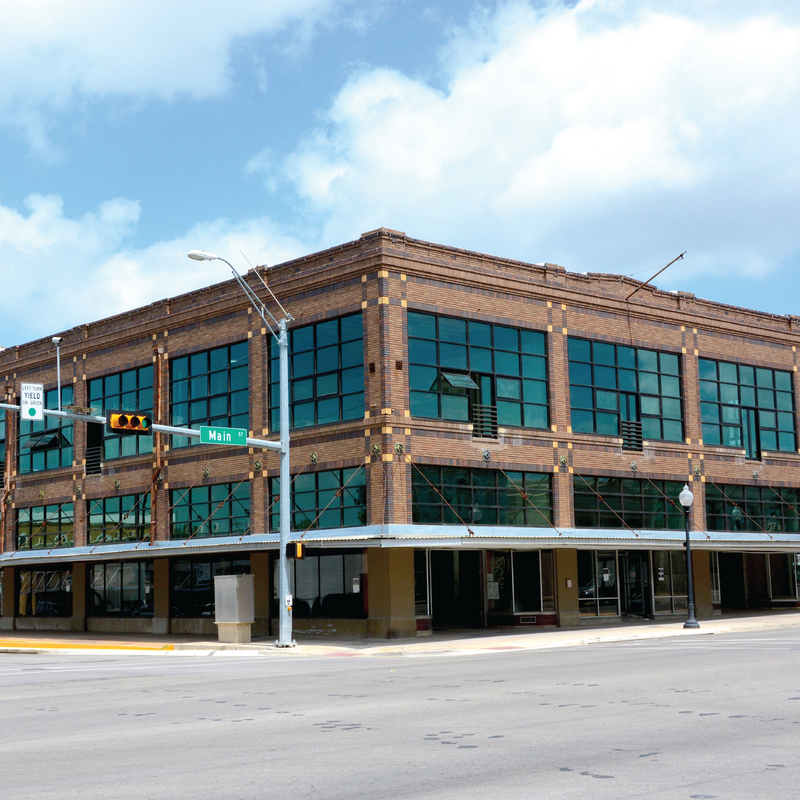 In earlier days, this was home to Taylor Meat Company, famous for Red Taylor Meat Wieners. 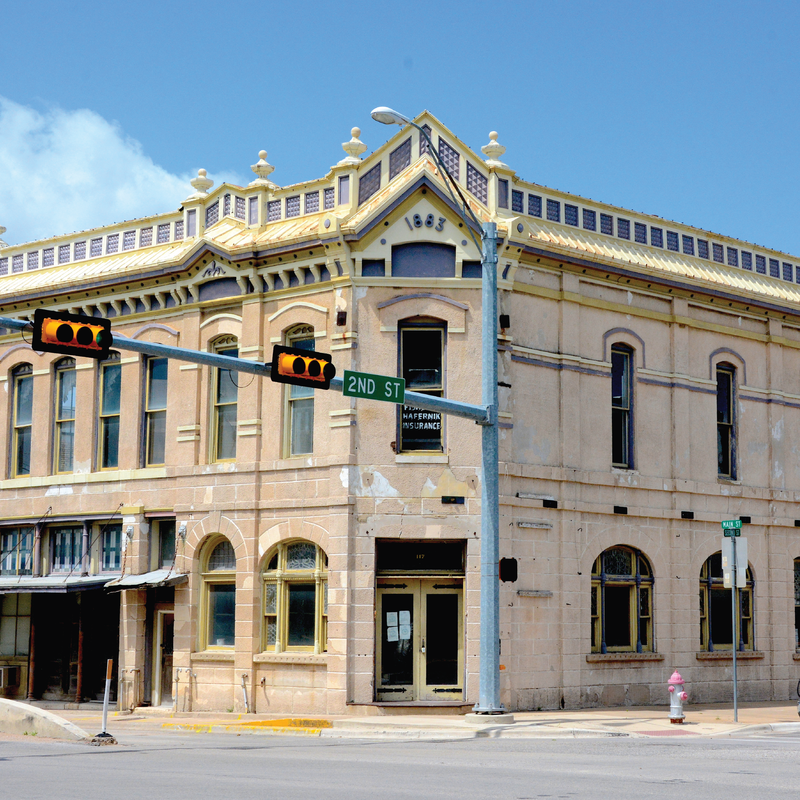 The First National Bank was built in 1883 and is currently being restored. The exterior of the building was plaster, textured and raked with joints to resemble cut stone. 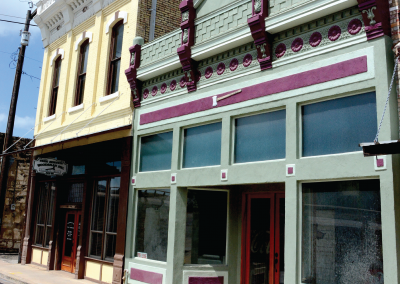 Pressed metal cornices were manufactured in Austin. 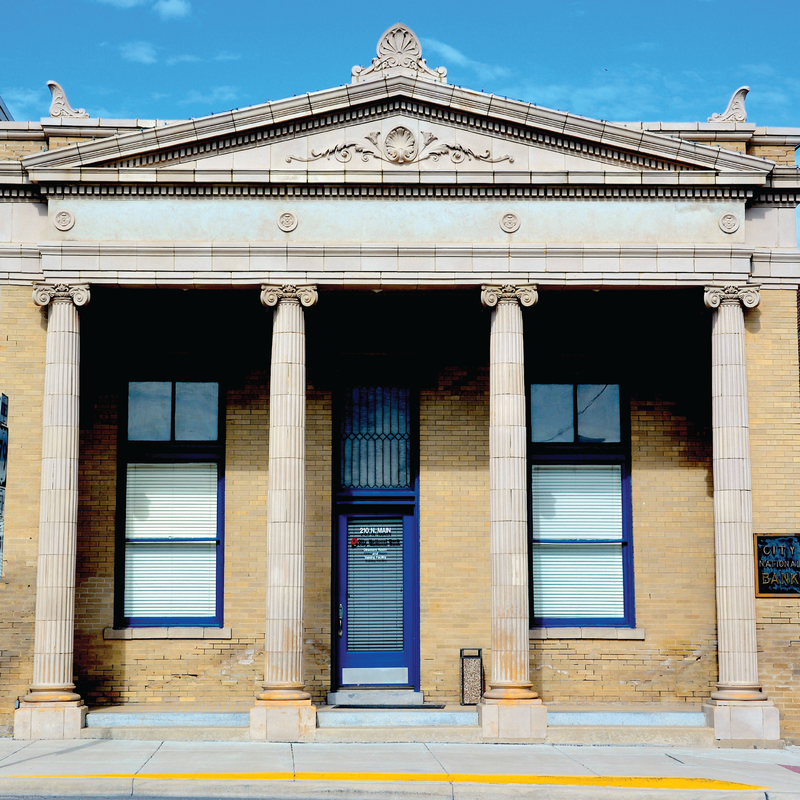 The front part was used as the bank and the south part originally housed a saloon and billiard parlor with a Masonic Hall on the second floor. Thompson and Tucker Lumber Company lumberyard office and storage was housed in this building. The second floor accessed by exterior stairs was the Y.M.C.A. There were wooden sidewalk canopies that originally ran the length of both north and east sides. The building later housed Safeway, followed by Taylor Paint and Hardware. Part of the building burned and was restored by the Taylor Conservation and Heritage Society. 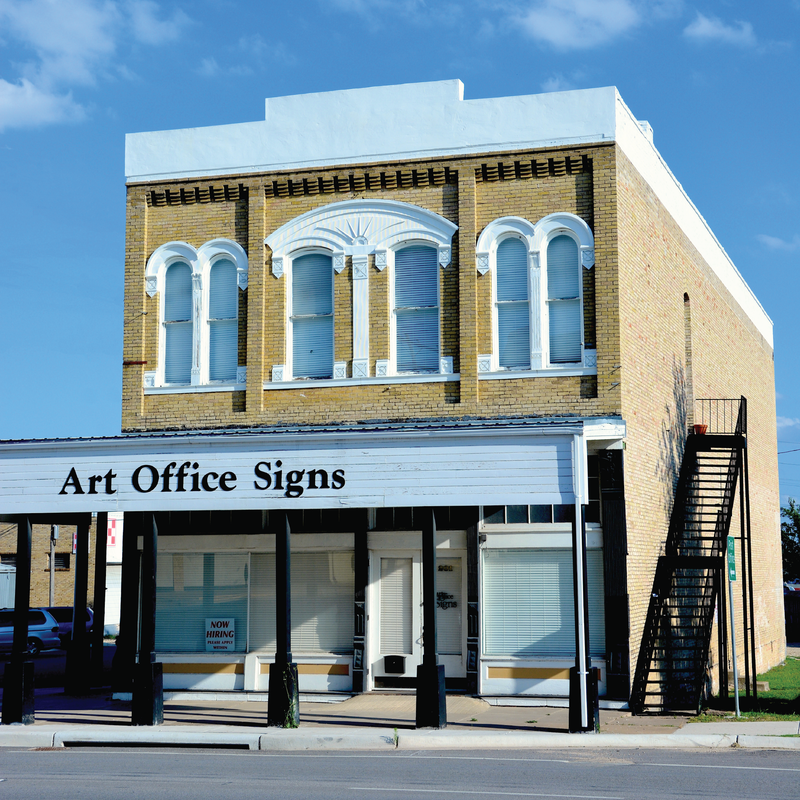 It is now owned by Art Office Signs. 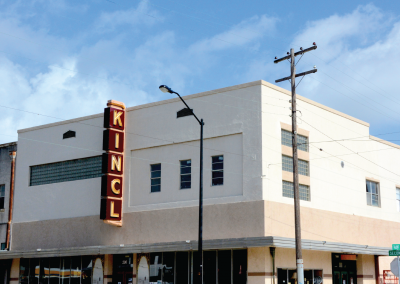 The Kincl building was opened in 1924 by Frank Kincl, Sr. as Taylor Harness & Saddle Shop. 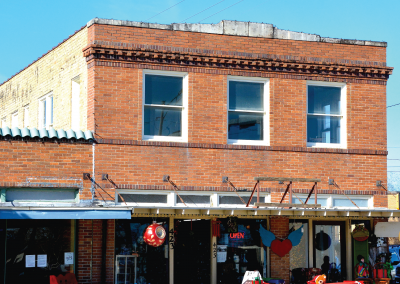 The second floor was added in 1928 and the name was changed in 1930 to Frank Kincl Hardware. Frigidaire air conditioning and heating was added in 1949. 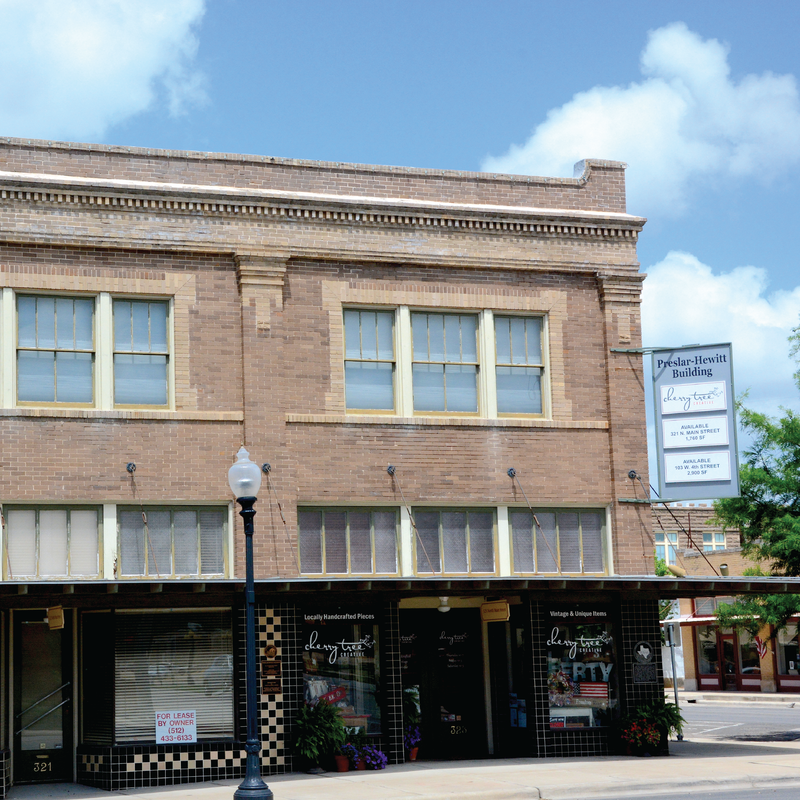 An article in 1938 mentioned the store sold “quality hardware and the finest radios on the market.” Chuck & Hoppy’s Marketplace occupies the first floor and the top floors include the home of Taylor Conservation & Heritage Society and an apartment. 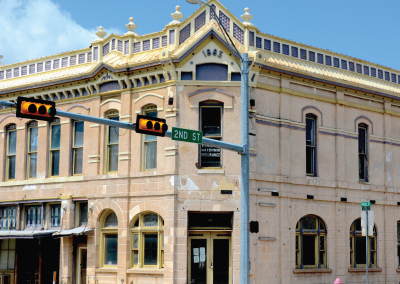 The Titsworth building was originally the Commercial Hotel constructed in the late 1800s. It burned around 1912 and the upper stories were not replaced. 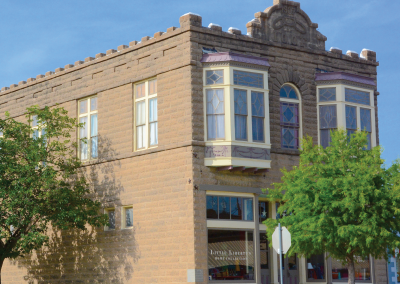 It has been completely restored and houses 120 Art Gallery, retail shops and studios. 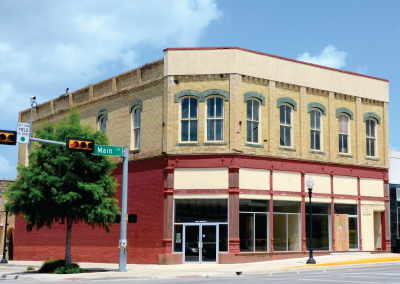 The Sturgis-Goldstein Department Store, now known as the McCrory Timmerman building, was built in 1888 and for many years housed McCrory’s Department Store. 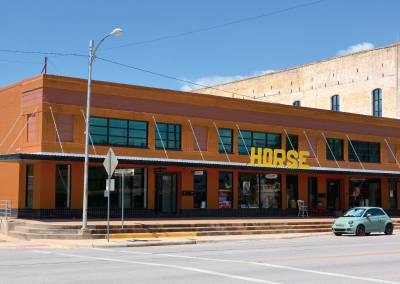 The store had “just about anything you could want.” The totally renovated building now includes Texas Beer Company, Pilot Knob wine shop, Curb Side Coffee, offices and four apartments . James W. Powell-Rosenberg Department Store was built in the early 1900s and later became Gellman’s Department Store. 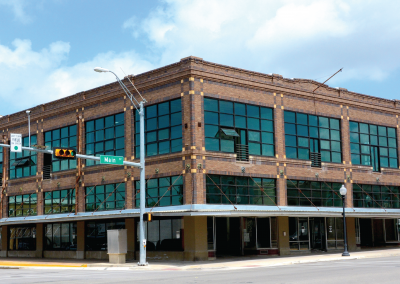 Texfit now occupies the renovated building. 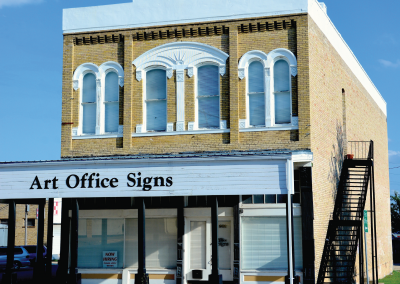 The Daliet Drug Store on the corner of 3rd and Main is a brick structure that can be documented as early as 1893. Remodeling following a fire was completed in 1927 and was later known as Luhn and Johns Drug Store. The upstairs serves as a residence. 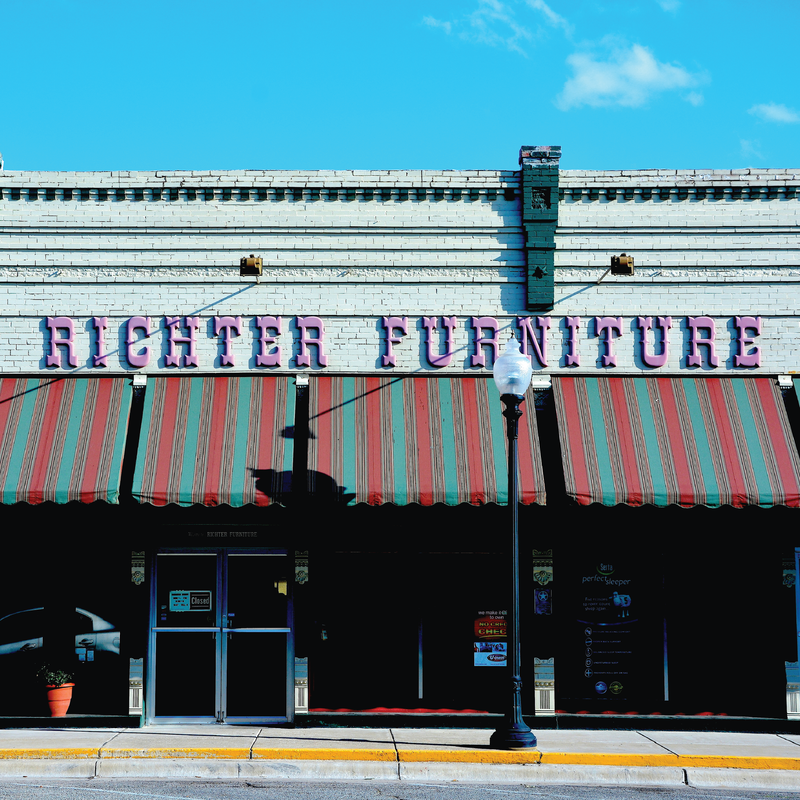 Richter Furniture Store was built in 1904 and housed a furniture business until 2018. 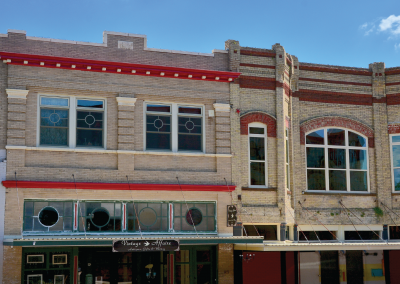 The cast-iron storefront and ransomed display windows are original and are of the Mesker family facades. Richter received the Taylor Conservation and Heritage Society’s Community Preservation Award in 1987. The original Howard Theater was located in this building, later moving across the street. 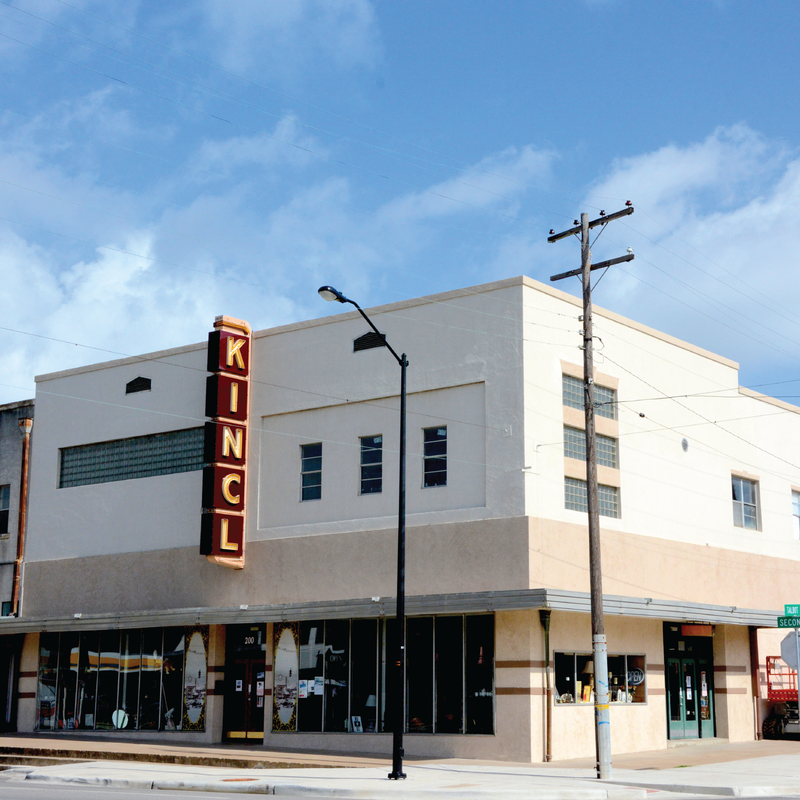 The theater was replaced by Duke & Ayres Nickel and Dime store and later became an antique mall. 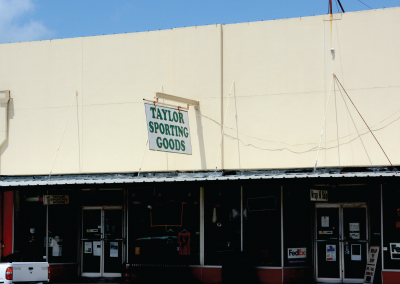 It is now Taylor Sporting Goods, FEDEX shipping and Taylor Office Products. 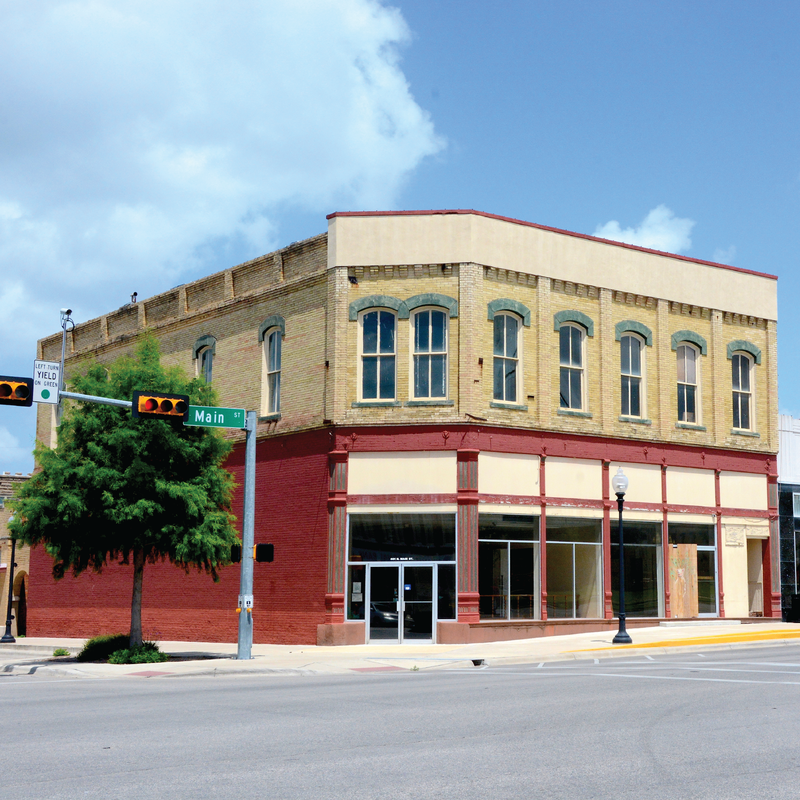 Preslar-Hewitt Drug Store was built in 1914 and at one time was home to Zoblosky Shoe Store. 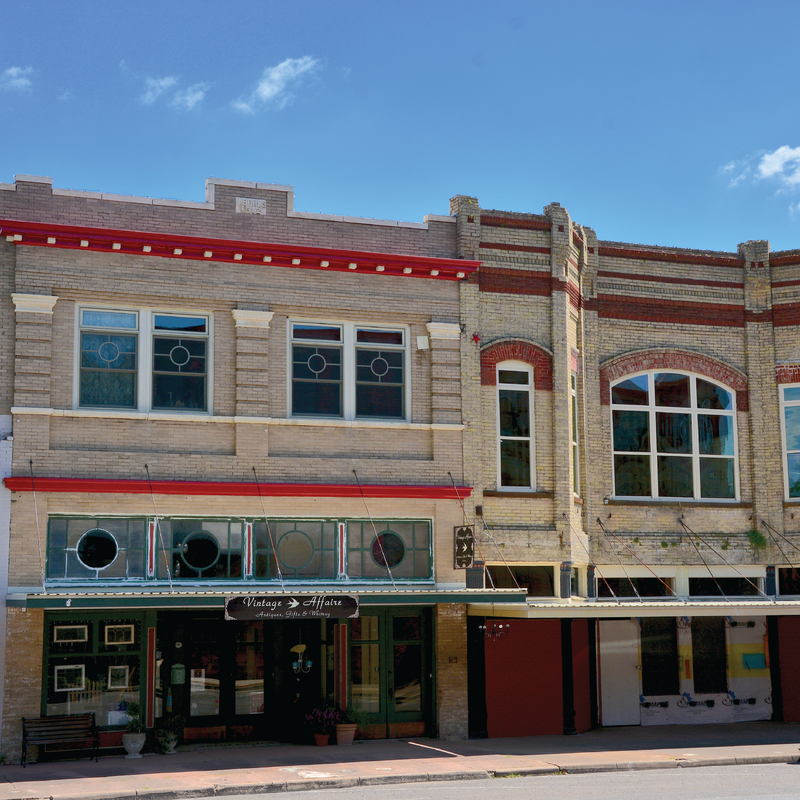 The building is now owned by Calvin & Anna Jayroe and has been recognized in the National Register of Historic Places by the U.S Department of the Interior and received the award of excellence from Taylor Main Street. 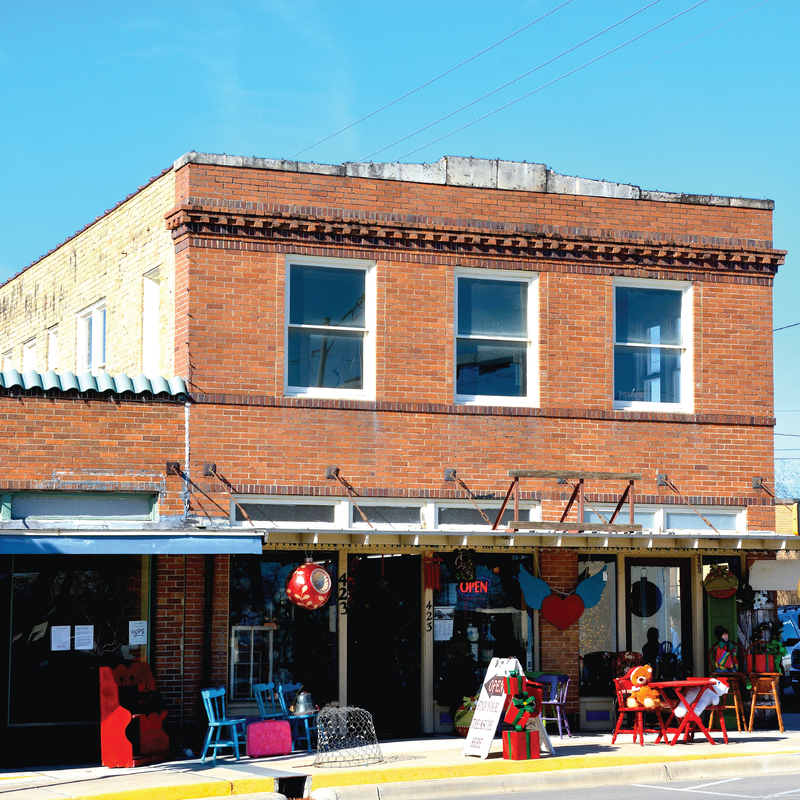 Currently, Cherry Tree Vintage and The Nest Box Home Mercantile are located in the building and there is an upstairs apartment. 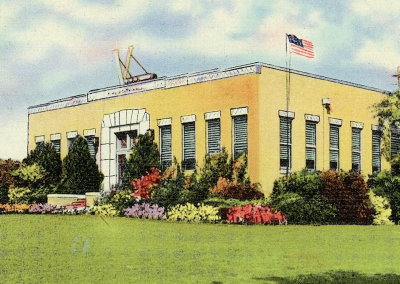 The U.S. Post Office was built in 1929-1930 and was constructed in the style of Renaissance Revival. 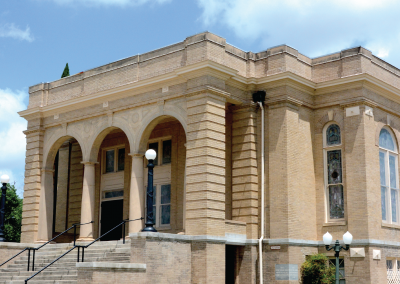 The building has many fine exterior and interior details, such as marble stairs with metal railings and multi-paned transom windows. 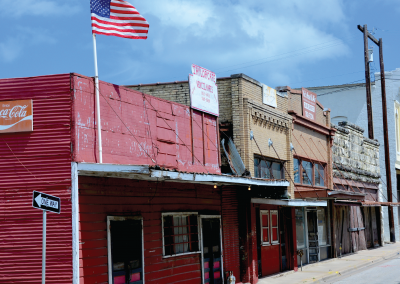 It is a recorded Texas Historic Landmark. The I.O.O.F. 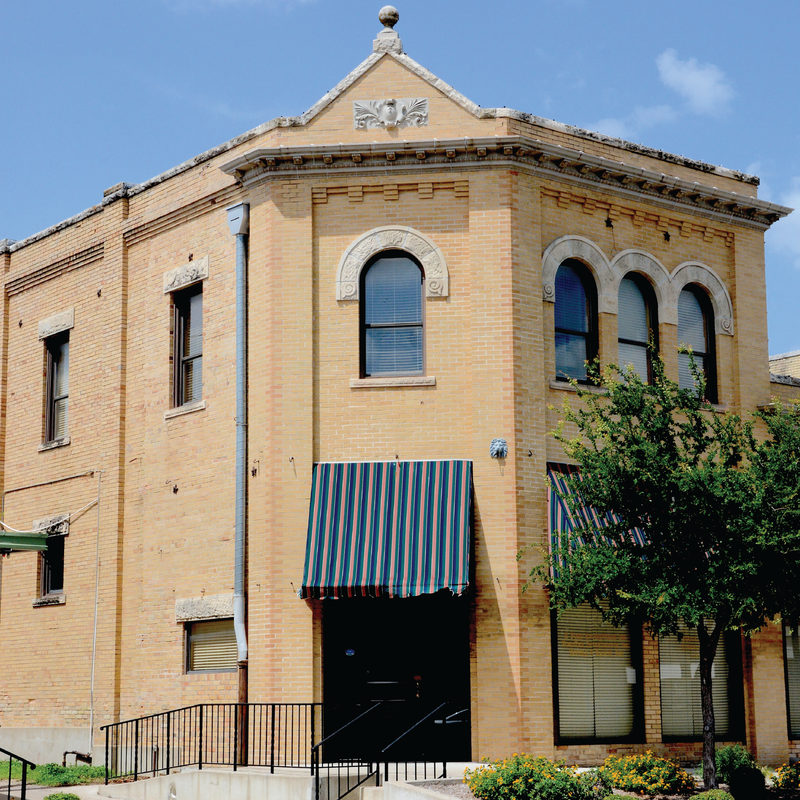 building was built in 1907 by the International Order of the Odd Fellows as a lodge hall. 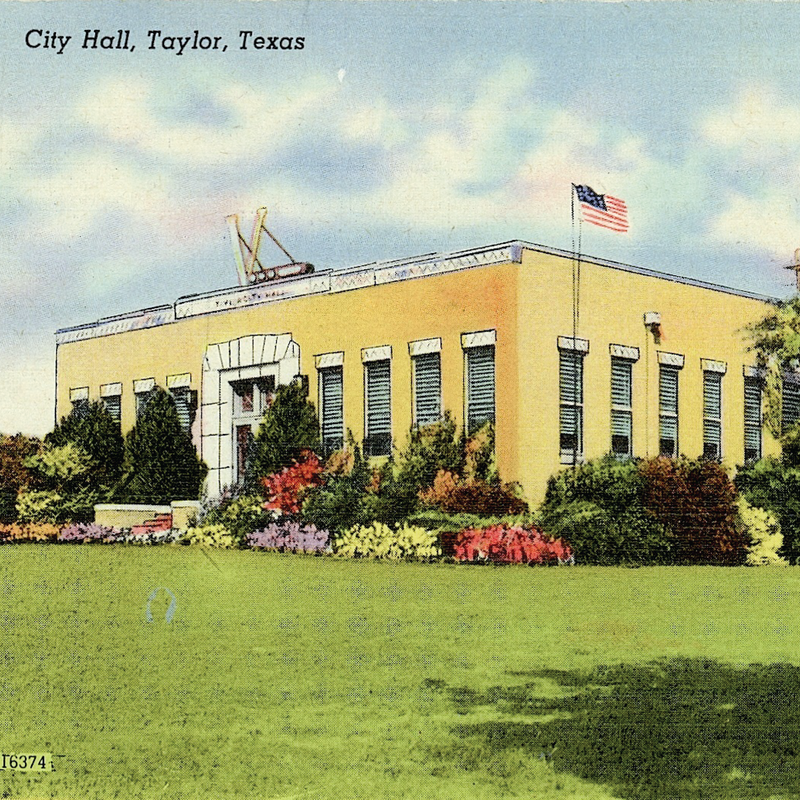 The ground floor was used for printing and newspaper publishing of the Taylor Daily Democrat. Exterior walls are concrete block, stylistically eclectic with its castellated parapets and bay windows. It is representative of the picturesque movement of the early 20th century, was once home to Cowan Home Decorating and now houses Mezoozah Boutique and Corner Sweets. 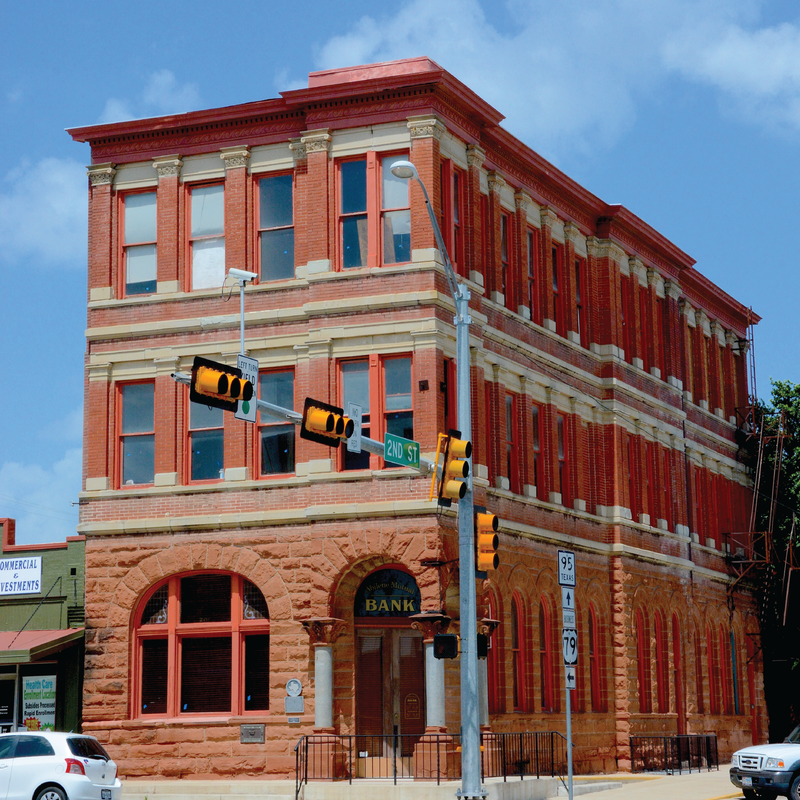 The Threadgill building was built in 1893. In 1916 the building housed the telephone exchange and later the post office. It was also the location of Ed Carver’s Auto Store and now houses Trouvaille Antiques. 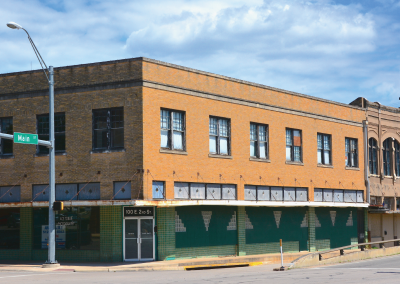 Texas Power and Light located at 407 N. Main was built in 1930 and is now being used as a beauty shop and a gift shop. The building has patterned stucco and black Carrara glass. The Star Tire Store was built in 1931. Gas pumps were located on the property during the 1920s. It is currently Karch Music. The Welch home was built in 1900 as a personal residence. It became the Forwood Funeral Home in 1910. In the late 1930s, it was purchased by Ray Condra and became Condra Funeral Home. 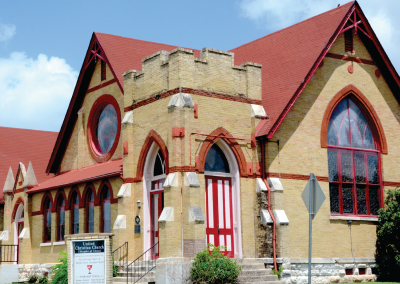 The First Christian Church was built in 1891 on land purchased in 1878 from the Texas Land Co. The original frame structure was replaced by a brick edifice, designed in the Gothic Revival style. 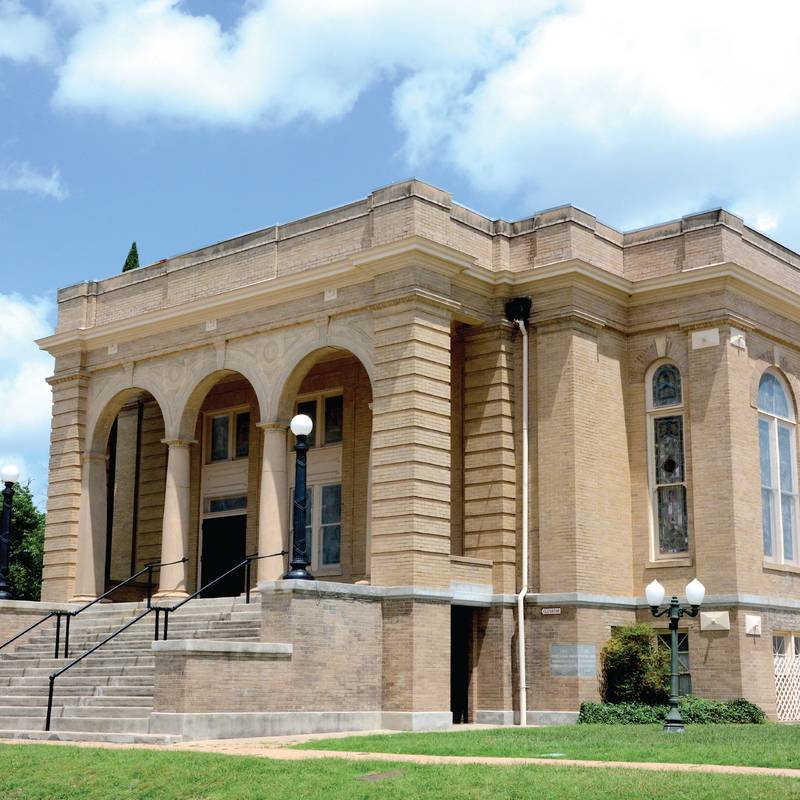 It was recorded as a Texas Historic Landmark in 1970. 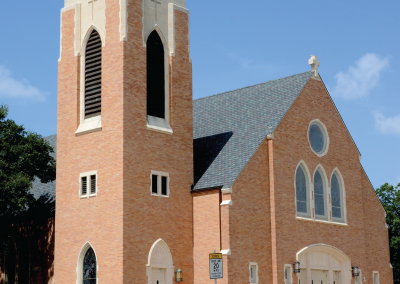 The First Presbyterian Church was organized in 1876 and is the first church of any denomination to be established in Taylor. 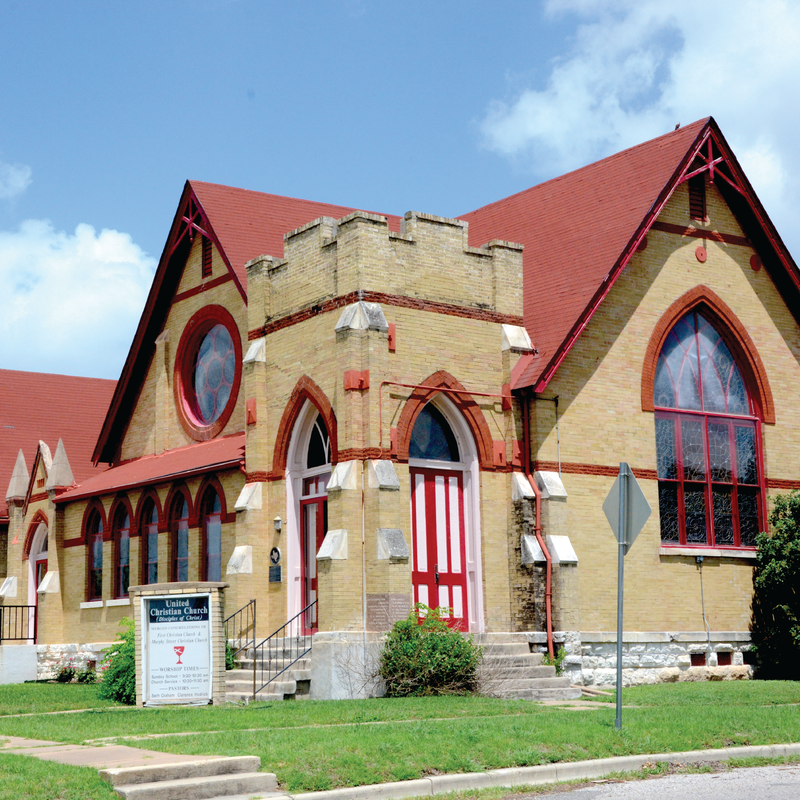 A frame church was built in 1878 and in 1912 it was replaced by the current stone structure. 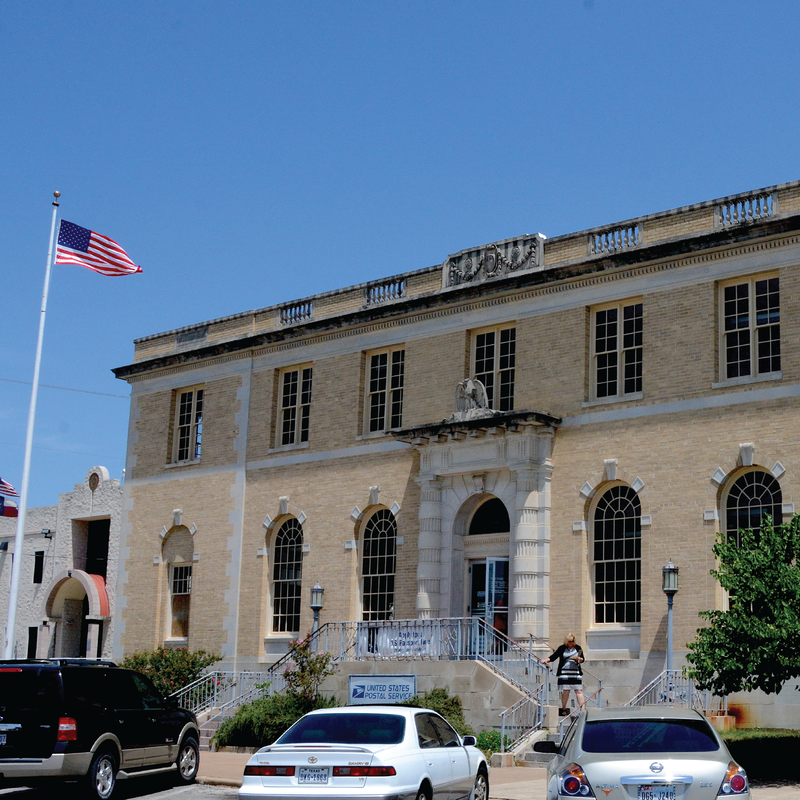 Heritage Square was the location of the WPA building that housed the previous city hall, police department and fire department. It was built in 1935 and demolished in 2014 due to major structural issues. 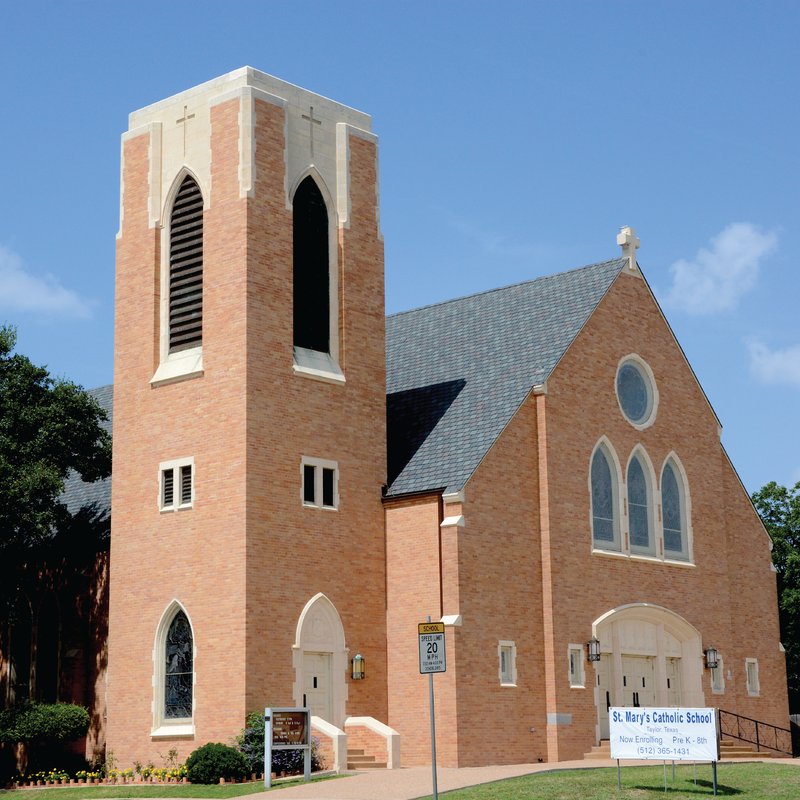 St Mary’s Church was founded in 1878 and the school, the oldest Catholic school in Williamson County, was opened in 1896. The church was built in classic architectural style with stained glass windows and a carved marble altar. 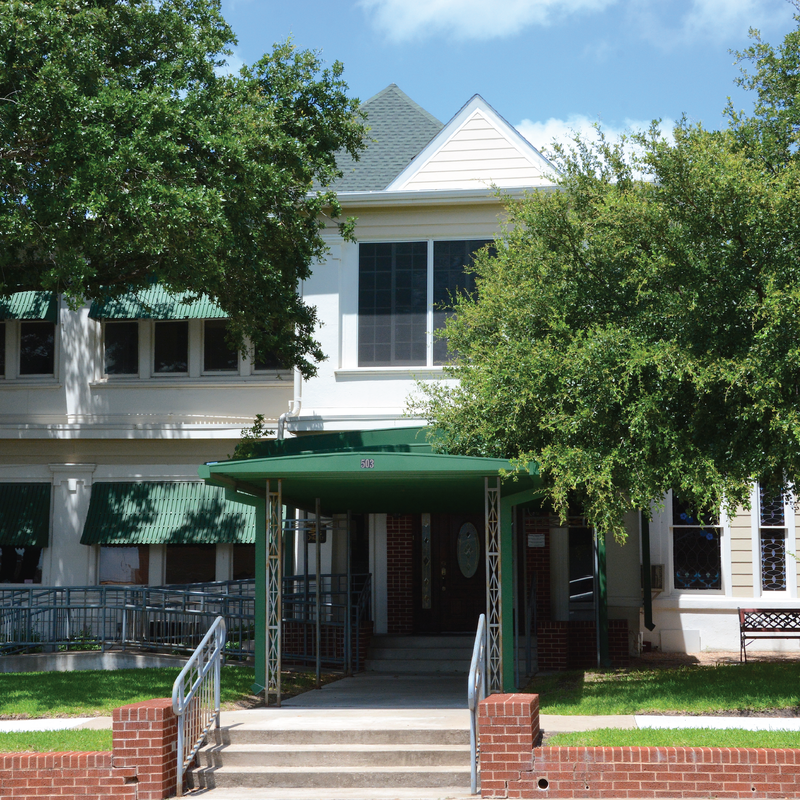 Eanes building construction began in June of 1911 with a loan of $5,000.00. 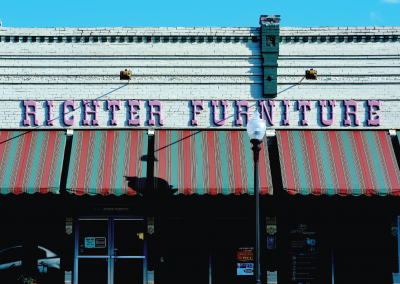 The building was originally a furniture store with a hand-operated elevator. Later, it was used as an automobile dealership and then a body shop for Schlitze Pontiac (later Grimm Pontiac). Restoration of the building began in 1984. The offices T-Ford Enterprises Inc., now occupy the building. 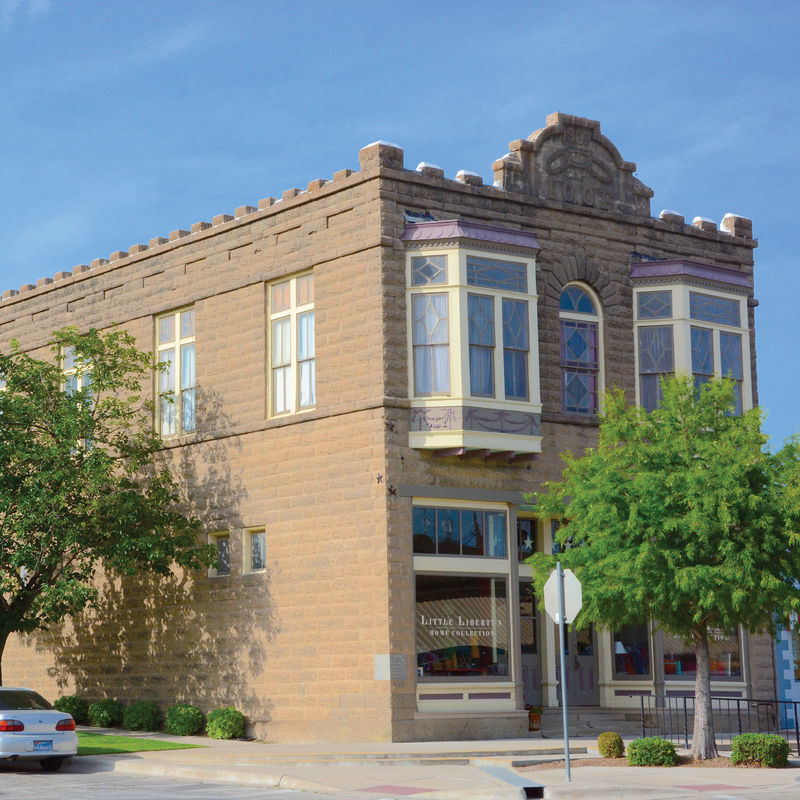 The Eikel-Prewitt Hardware building was constructed in 1893 and now serves as Citizens National Bank. It was renovated in 1985 to serve as a savings and loan institution. Original skylights have been opened to permit natural light to the interior. 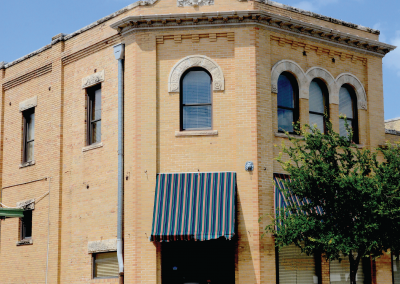 The building is a Texas Historic Landmark. 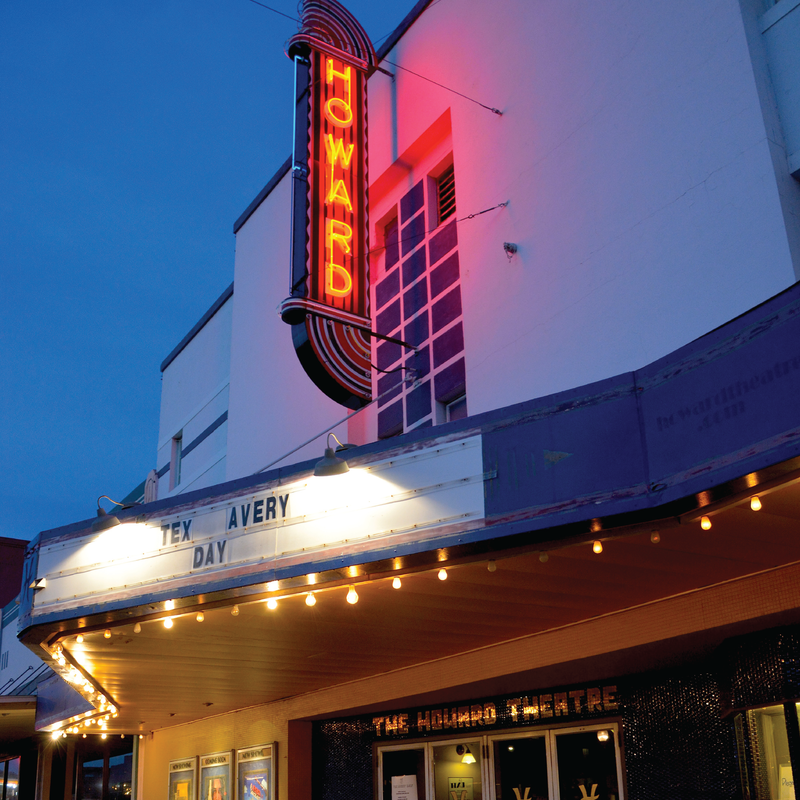 The current Howard Theatre originally opened on the west side of Main at 305 N. Main. 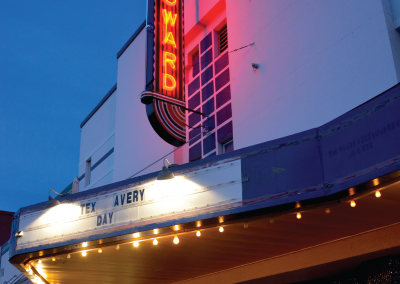 The Rita Theater opened in 1925 where the Howard now resides. The owner of both theaters closed the Rita and moved the Howard across the street. In 2001, the Farney’s (sp?) 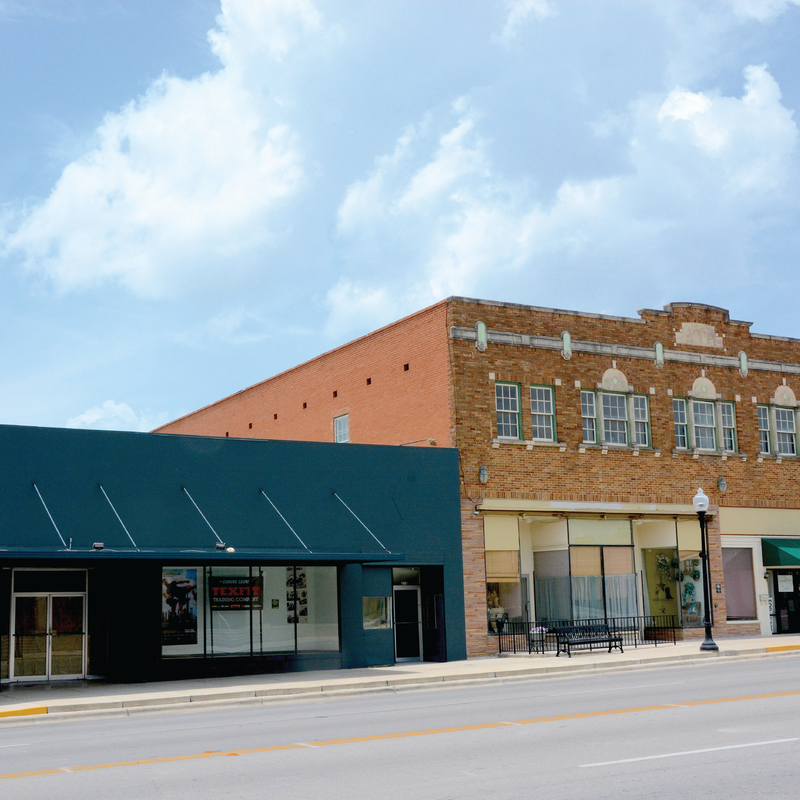 purchased the building and have modernized the structure stacking two new theaters in the shell of the old one. 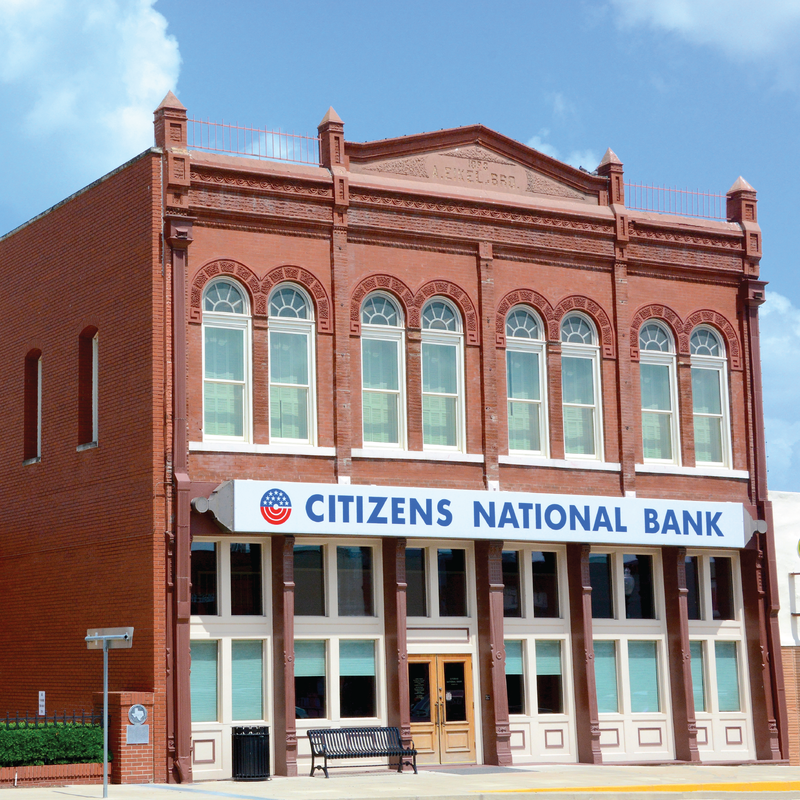 City National Bank was constructed in 1900. 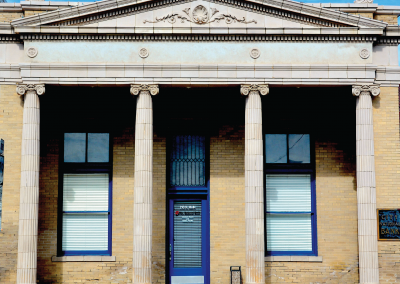 This is the only remaining historic building on this block and remains the only example of high-style Classical revival architecture in Taylor. 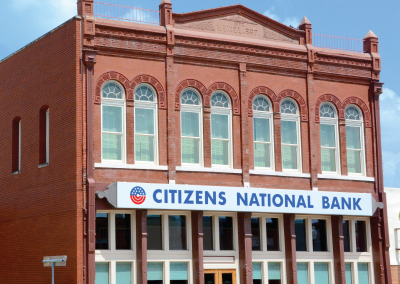 It was home to the bank until the new building was constructed on the north side and opened in 1965. 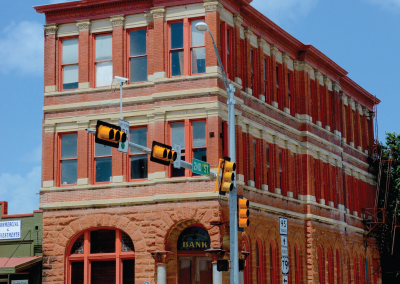 The original Taylor National Bank was established at this location in 1888 and later merged with First National to become First Taylor National Bank. 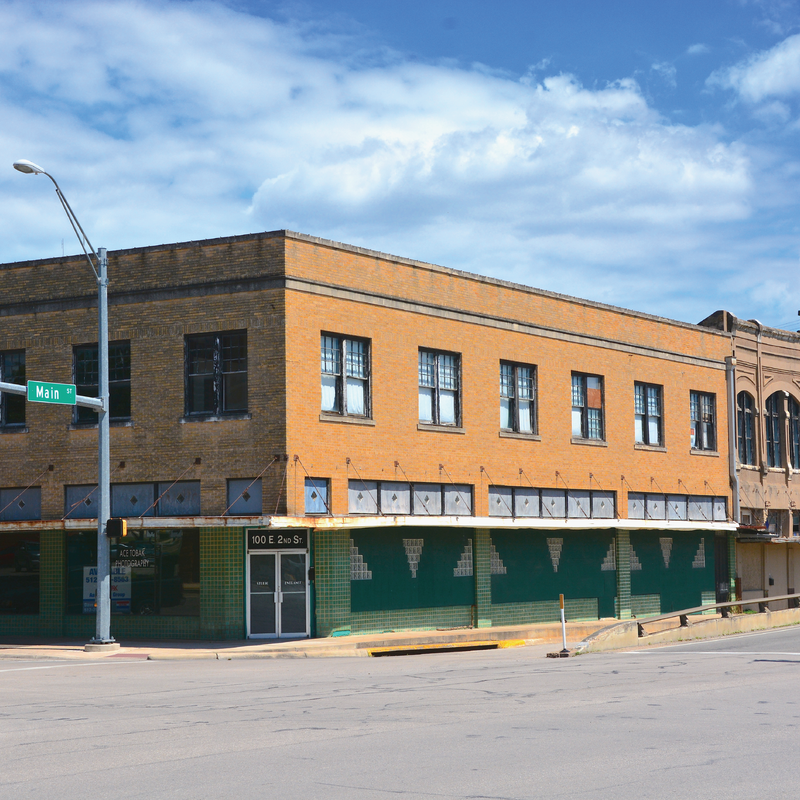 The three-story building with classical details of paired brick pilasters and finely-carved column capitals is currently being renovated. 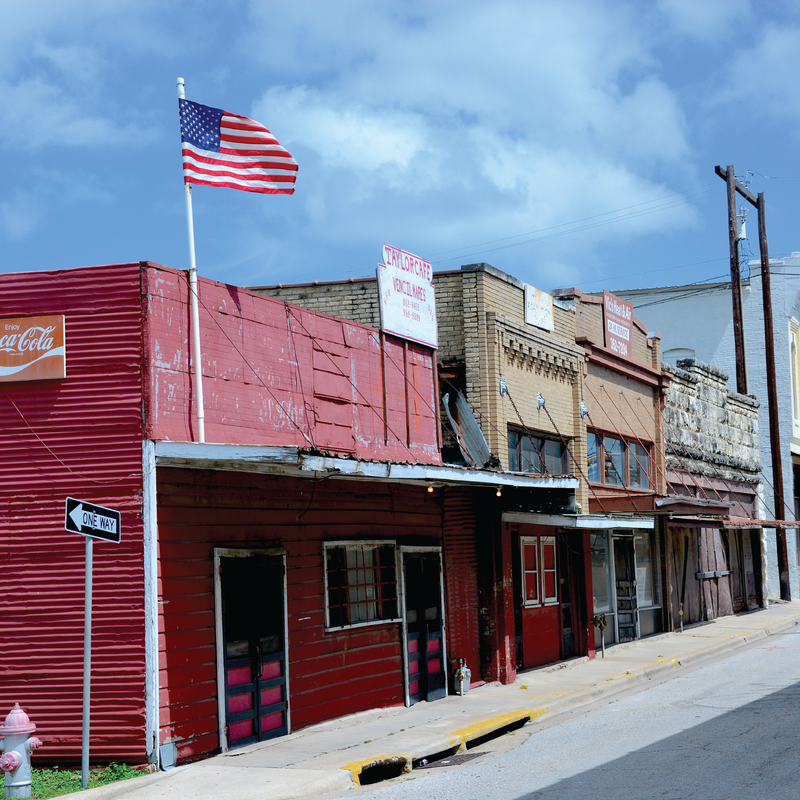 It was recorded as a Texas Historic Landmark in 1980. 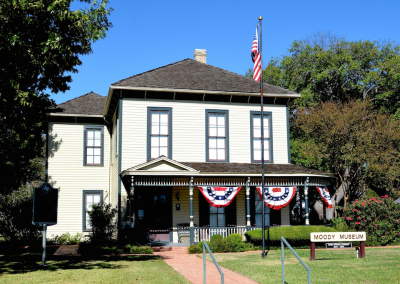 The Moody Museum, built in 1887, became the home of Dan Moody, Taylor’s first mayor, when he married Nancy Robertson in 1890. 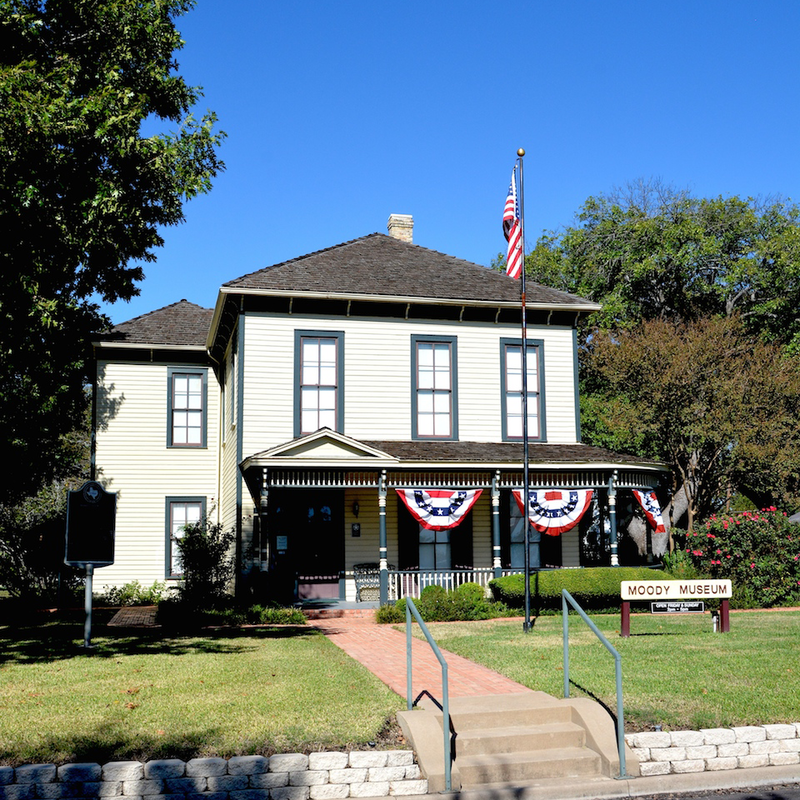 It was the childhood home of Texas Governor Dan Moody. Miss Mary Moody, Dan’s sister, lived in the home from 1891-1975 when she donated it to the City to be used as a museum. The John Bohls building, currently Vintage Affair and the owner’s residence, was erected in 1912 and operated as a saloon until Bohls death in 1917. His sons turned it into a silent movie theatre called The Queen. 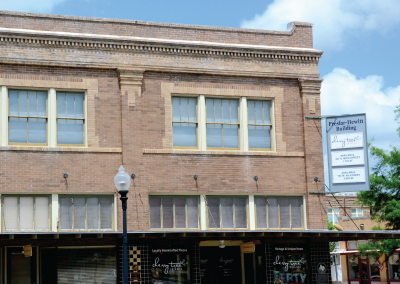 The building adjoining the west side was purchased by the owners of Vintage Affair and is being renovated. 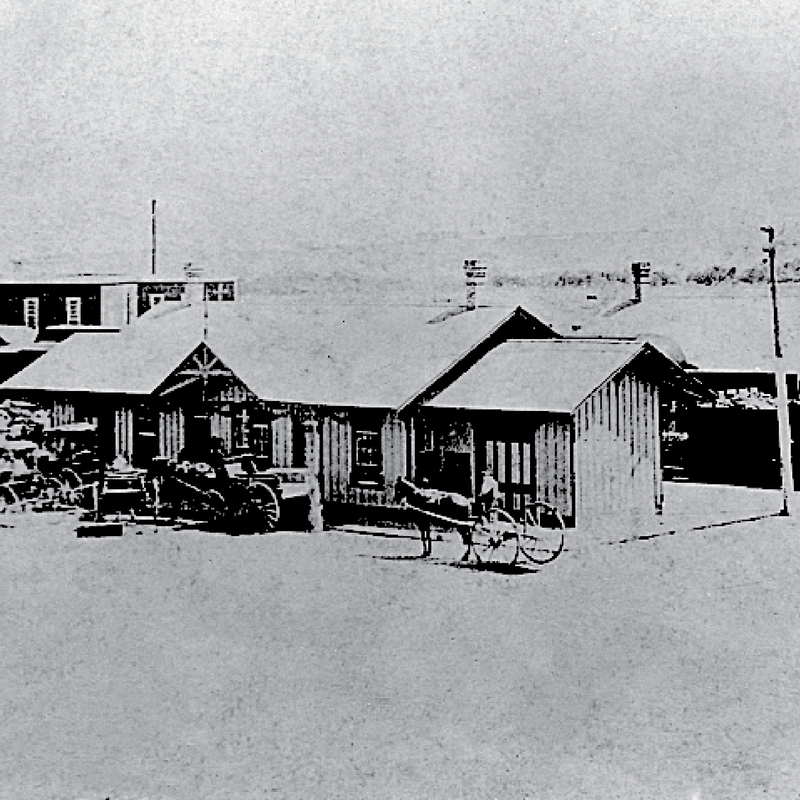 The livery/blacksmith and wagon outfitting and repair buildings on the southeast corner of Second & Main were built between 1885 and 1898. 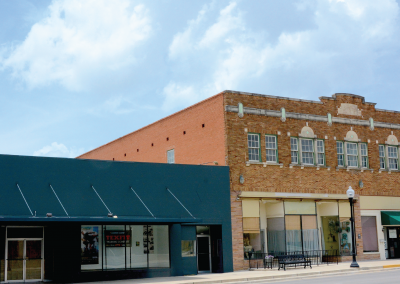 Starting in the 1920s the corner building served as Kennedy, Miller & Baker Appliance, known for the RCA dog statue in the window. It became Warren Tire & Supply, selling B.F. Goodrich products, and finally as Uptown Billiard Parlor. 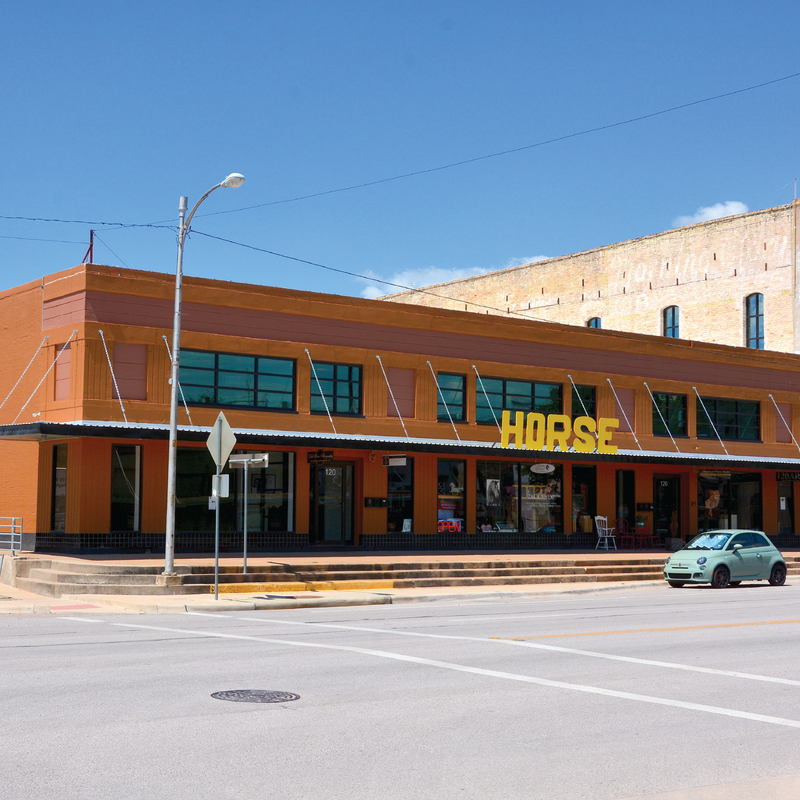 In 2018, the building was purchased by native Taylorite, architect Doug Moss, who is renovating it into live-work apartments and retail space.